A major chapter of my life is coming to a close. I signed on with The National Holistic Institute in the spring of 2001, and last Wednesday, I tendered my resignation. It’s been an amazing journey. I’ve seen the school change a lot in that time. When I began, NHI had one campus and the original founder, Carol Carpenter, was still running the show! Carol handed the reins to Mason and Tim, and things really took off. Now our NHI family has spread over ten campuses throughout California. I’ve seen myself change a lot in that time too. I had worked jobs before, of course, but teaching for NHI was my first real step into a career. As soon as I read the company motto, Helping People Have Work They Love, I knew I had to be a part of it. I remember my teacher orientation, my first classes as second teacher and then as lead teacher. I remember my first WHOOSH! and how good it felt to move that energy! My initial interest in massage therapy came from my love of meditation and martial arts, and I began my NHI adventures teaching shiatsu. Over time, it seems I developed a reputation for eastern insights, but I was in awe of the folks who taught the sciences of kinesiology, anatomy and physiology, and the technical modalities like myofascial therapy. Somewhere along the line, my mentors and managers decided to help me level up and I was nudged towards these subjects. I was intimidated but they seemed to have faith in my abilities, so I embraced the tiger. Funny things happen when we take the plunge and get out of our comfort zones! Now, the sciences are some of my favorite classes to teach. When I am lecturing on Physiology and Pathology, I like to balance the scientific logic with an intuitive and holistic perspective. And when I teach shiatsu, or acupressure, or energy work, I like to invite skepticism and an empirical curiosity. It’s all about the balance, you see. I’ve learned a lot about other people too. As a teacher, a mentor, and later a staff trainer, I’ve seen when to push a little harder, and when to let up. When to teach, and when to learn. When to speak, and when to listen. When to empty my cup, and when to help someone else empty – or fill – their own. For everything, it seems, there is a season. I’ve always told my students that I am a teacher but also a student and that they are likewise teachers and students too. We all learn together and we all grow together. Helping them have work they love is our mission, and in doing so, we earn that love for ourselves. So what comes next for me? A couple of years ago, life brought me a new way to teach and learn: my daughter River was born. A short while later, her little sister Rain came into the world. Like a salmon driven upstream to spawn, I began to feel a pullback to my ancestral homeland in the mountains of North Carolina where, over two decades ago, my journey into the healing arts began. I’ll be taking what I’ve learned with NHI back to the place where it all began for me. 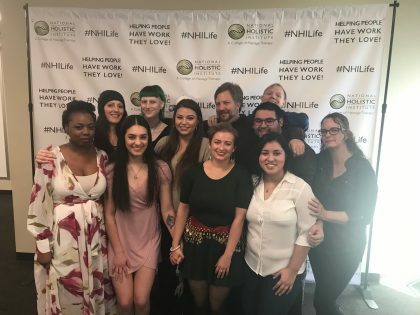 It’s a strange, exciting, and bittersweet feeling: I’m as deeply in love with NHI as I’ve ever been… and it’s also time for the next chapter in my saga to unfold. In a few days, I’ll be part of my last graduation ceremony at NHI. I’m planning for the final WHOOSH! to be epic.